In the last episode of the IT Provider Network, Episode 30, we talked about building an inside/outside sales organization within your company. In today’s episode, I want to share with you my recent experiences outsourcing telemarketing and appointment to a 3rd party. Episode 31 has taken quite a while to get recorded. I have had a crazy end to the winter. I attended three different conferences and launched the beginnings of another business. My first conference was PodFest 2018 in Orlando. Podfest is an excellent niche event for independent podcasters. Over the last two years, it has really exploded as more and more people are becoming aware of podcasts. Companies like NPR and podcasts like Serial have done a lot to bring podcasts more mainstream. The second conference I attended was Traffic and Conversion in San Diego. I have to tell you it’s nice to go to sunny California in the middle of a noreaster back east. Traffic and Conversion is a large conference focusing on the latest tips and tricks to get more people to your website and convert more of those visitors to buyers. I learned a lot, but when I was done, I thought my head was going to explore. I put a couple of videos on Instagram with some good takeaways, if you’re interested you can follow me @TerryRossi on Instagram. Drop me a DM and let me know you’re a podcast listener and I will follow you back. Last weekend I was at a conference for my new business. Before I tell you what it is, you have to promise not to judge. I am going into the Specialty Coffee business. I have a roaster, and my business partner and I are building a cafe’. I am like a madman learning the art and skills required to one day make great coffee and some tasty treats. Right now the coffee I am roasting tastes like crap, but it is getting better with every roast. Like the computer business, there is SO MUCH to learn. I am really enjoying it. I know this sounds bizarre, but I have been involved in the hospitality industry since I was 13 so it’s not that far off base… ok maybe a little. So CoffeeFest in Baltimore was the third conference I attended just last week. And now I am down in Orlando again for Funnel Hackers Live, Russell Brunson’s event learning about sales funnels and all the people that make millions selling weight loss and supplements and dreams! Why? Because I can, and I am genuinely interested. I heard a quote today from Gary Vaynerchuk. He said, and I am paraphrasing, without the f-bombs, our smartphones are like the TV sets of the 1960’s, and he’s right. We have built-in distribution, built-in networks and all we need to do is build shows and create audiences. I encourage all of you to build your audiences and figure out how to keep selling to them. And most importantly do what floats your boat. This isn’t a dress rehearsal. So make a long story short, that’s what has taken me so long to get this podcast out the door. So back to the business at hand. 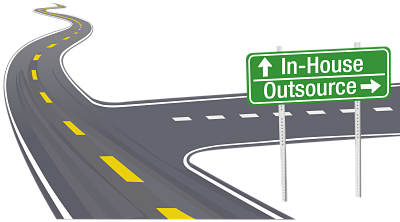 Should you outsource your appointment setting or built it up in-house. Well, I’ll cut to the chase, and tell you, I don’t know. As I mentioned in Episode 30 of the IT Provider Network podcast, I had an inside sales, telemarketer, appointment setter for almost ten years. He was heads down, nose to the grindstone, dialing for dollars all day every day BUT I think I was really lucky. I had one guy for ten years making 80 dials a day. I think that’s an anomaly. I think it is more typical that you would be hiring someone almost continuously. They are a different breed, and if you are a small business with one caller, it will be hard to keep and motivate that person. I’m not saying it can’t be done just that you might spend a good amount of time, hiring, training and firing people that don’t get it done or fit your culture. The caller in a smaller MSP could be on an island. Being told NO most of the day and being the only one in your department is a tough road for most. So having a caller that is part of a team of callers sharing tip, tricks, celebrating wins and being part of a group of like-minded peers is one reason that you might outsource your appointment setting. In the outside organization, if they specialize in cold calling for MSP, their entire focus will be on getting the people and the process down pat. Think about it, do you think you could do a better job at building an appointment setting team if you devoted your entire day to them? If every new hire you had was for the same type of employee, do you think you could refine the process so that you could get the best people? Wouldn’t you become really good at picking out the superstars? How about training? If you hired just cold callers, do you think you could come up with a training plan that would easily ramp up new people into your process, even if it was a high turnover job? What about the actual cold calling, do you think if you had a room full of cold callers that you could pick out the best premises, icebreakers, decision trees and closes? If you had a room full of people calling into different geographical areas, do you think you could do a better job of appointment setting by having the ability to move people to call different areas based on race, gender, accent, or personality? Wow – I might have just talked myself into outsourcing our inside sales department! Actually, I already did, at least for our MSP business but it’s not all rosy either. While there are some big advantages to outsources, there are also some shortcomings too. Like continuity. When you appointment setting is done hundreds or thousands of miles away in a different company with different systems, it is very difficult to have all of the continuity that you have when your employee is cold calling for you. For one, in most arrangements, you never get to actually “hear” the call. You don’t know “exactly” how the caller is representing your company. Sure you get a copy of the script, and in some cases, you can even help refine it, but if the caller is compensated on appointments then chances are they are going to use whatever works best even if that is not directly in line with your “company way”. You also might be plagued with a bunch of “newbies” working at your outsourced appointment setter. Although no different than if they were your employees you might need to constantly restart the relationship with the caller or callers, explaining your company, your company way, and your selling process. Then there is the data flow, is your outsourced appointment setter working in your system, your PSA or CRM or are they working in another system? If they are working in your system is there clear procedures on how you want contacts, activities, and opportunities created and updated? If they are not working in your system then is there a data bridge? If not how is data passing back and forth between your company and theirs? Is this a manual process, are you paying someone to do data entry work or worse are you not updating your systems? Then there is the issue of watercooler talk or the feedback loop. While it’s not impossible to do with a 3rd party, it is much harder to make your outsourced caller part of the team. There is little or no watercooler talk, there is not a sense of teamwork as there is with a direct employee and as a result, there is much less of a team feeling. All of these negatives are assuming that you have one or more fulltime callers. What if you have a fractional caller, someone you get for less than 40 hours a week, or if you don’t get any specific caller but just a bank of callers trying to make appointments on behalf of your company? To be honest, I can’t really imagine the gyrations you would need to do on your first appointment to turn that appointment into something meaningful. We’re not in the widget business we’re in the trust business. I think that trust starts or dies with the first phone call. So a few things to think about if you are looking to outsource your MSP appointment setting. I use Marketopia, and we have been happy with the appointment setting services they provide. We have a full-time caller who dials from our list all day every weekday. I know other people that have used Managed Service Pro and are also happy with their service, but I cannot personally vouch for them. If you decide to reach out to either Marketopia or Managed Services Pro, please tell them that the IT Provider Network sent you. I don’t have affiliate programs with either of them, but I would like the referral.